Time and time again, people complain about hating Passover food. Matzo is “boring” and constipating. You “can’t eat anything good,” and “always gain a few pounds.” While those sentiments may have been legit back in the ‘80’s, when options were few and creativity was lacking, today’s Passover palate is loaded with a bounty of healthful options. Truth be told, you don’t really need leavening in your diet. Most foods with leavening are processed and less than healthful. Focus on the challenge of eating happily, healthfully and successfully through the Passover holiday and use it as a time to celebrate Jewish heritage and stick to your healthy ways by eating lots of fresh produce and lean protein, and less of the ‘Kosher for Passover’ foods you find on the shelves. Of course, if you are going to indulge this holiday season, indulge wisely. Here’s how. Passover is a great time to highlight coconut and all it has to offer. Thanks to its unique fatty acid profile, super high fiber content and mineral rich nutrient content, coconut in all forms belongs in your kitchen. A little goes a long way, though so remember to portion control. Stick to two macaroons with your tea for dessert. In a mixing bowl, combine the first 4 ingredients and blend well. Mix the egg whites and vanilla in a separate bowl until frothy. Combine the two bowls to make a batter and let it rest for 30 minutes. Line a baking sheet with parchment paper or silpat and roll into tablespoon sized balls. Place on baking sheet. Bake for 20 minutes, until the bottoms are golden brown. 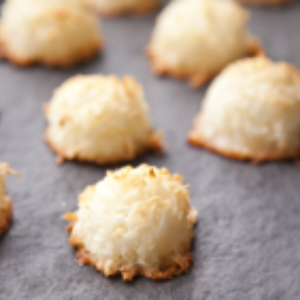 Let the macaroons cool on the baking sheet before removing them. Prepare the charoset by mixing all of the charoset ingredients together. This can be made a day in advance and chilled in the refrigerator. Preheat the oven to 350˚F and prepare 20 muffin cups with liners. In a bowl, whisk together all of the dry ingredients, from the almond flour to the salt. In a separate bowl, mix the wet ingredients from the honey to the vanilla. Combine the dry into the wet ingredients and fold in 1 cup charoset. Fill the muffin cups ½ way and bake for 18 minutes. Muffins are ready when a toothpick inserted into the center comes out clean.